No need to say that Doc format is very popular among users due to the popularity of Microsoft Office tools. At the same time, however, experienced computer users are aware of the fact that Doc files are not as secure as PDF documents are. So may people have to convert Doc files to PDF. It easily combines any number of Doc files into one multi-page PDF. It can even combine Doc files by folders keeping folder structure. It is not limited to Doc or PDF. PDF Combine Pro can merge RTF, TXT, XLS, XLSX, HTML, HTM, MHT, PS, EPS, and PRN as well. It creates a Table of contents (bookmarks) based on your files names or titles. PDF Combine Pro offers some helpful extra options like adding text watermarks, dates, or page counters. It has a user-friendly interface and can be mastered even by a beginning user in a matter of minutes. Plus it offers full command line support so that you could merge Doc to PDF via command line. It features free upgrades for the first 12 months. Further paid upgrades are optional. 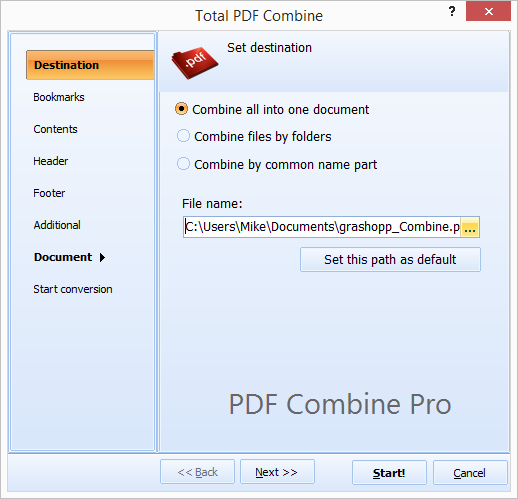 Download PDF Combine Pro from CoolUtils website. 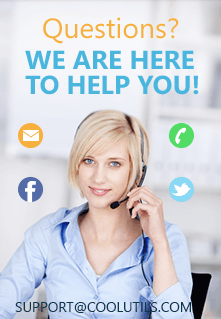 You can use the free trial version or a fully functional paid version. From the automatically generated tree of files and folders on your left select the Doc files you want to merge. Once done, click on the "Combine to PDF" button. You can select the destination folder, add bookmarks, create Contents page, add header, footer and document info (subject, author, title and more). When you are ready, simply click "Start!" and enjoy 100% automatic process of file merging! Click here to learn more about PDF Combine Pro or download its free 30-day trial version! It runs fine on Windows XP/2003/Vista/7/8/10.